Manufacturer of Textile & Fabric Supply. The basic application of the lace products is for the doll clothes edge, socks edge, female underwear, underclothes, such as bras, underpants, nightclothes, etc. 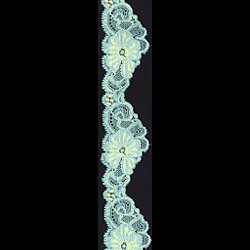 Due to the varied fashion styles, the lace are also applicable to embossing, shoes, jeans, etc. 1. Pattern distance: 7.2 cm. 2. Width: 3.8 cm. 3. Material: L: 10.5%, N:89.5% (including D and ITS test).